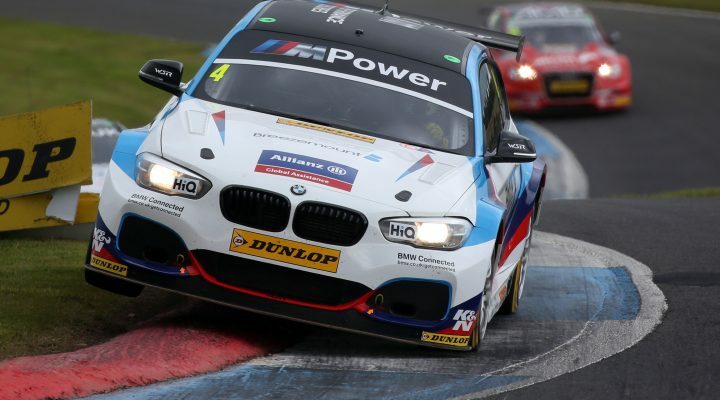 Double BTCC champion Colin Turkington left it late to claim the quickest time of the day so far, as the Team BMW star set the pace in Free Practice Two at Knockhill. Adrian Flux Subaru Racing driver Ash Sutton had been on top for the majority of the session, but the young championship challenger eventually had to settle for second place. James Cole confirmed Subaru’s pace by claiming third, as the former Formula Ford UK champion continues his recent upturn in form. Honda machinery filled the next two positions in the shape of Matt Neal’s Halfords Yuasa Racing car and the independently run Eurotech Civic Type R of Jack Goff. Both drivers have performed well in qualifying this term with Neal having taken two pole positions and Goff claiming his own maiden pole at Snetterton last time out. Andrew Jordan, Jason Plato and Rob Collard further highlighted the advantages seemingly enjoyed by rear-wheel drive cars around the tight and undulating 1.3-mile circuit as the experienced trio took sixth, seventh and ninth places respectively. Two young drivers filled the other top ten positions with Laser Tools Racing’s Aiden Moffat in eighth and AmDTuning.com’s Ant Whorton-Eales in tenth. The fast and frenetic session saw all 32 drivers recording representative lap times with the top 26 being blanketed by an incredible 0.896s. MG Racing RCIB Insurance’s Josh Cook brought up the rear of the field although his MG6 did suffer with a suspected oil leak. Qualifying for Round 19 of the 2017 Dunlop MSA British Touring Car Championship takes places at 16:10 later today with the action being streamed live and exclusively at www.itv.com/btcc.